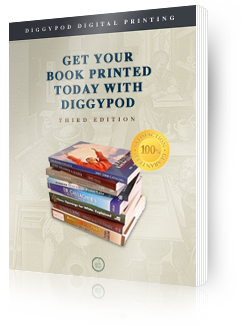 We are so confident in the quality of the books we print, that we will send you a Free DiggyPOD Book for you to review our binding and printing quality. The quality of our Color and Black and White printing. The paper options we offer. A Color Cover with Gloss Lamination. Perfect binding with a hinged binding. By contacting DiggyPOD, your e-mail address will not be distributed or sold. All of our samples are shipped out via United States Postal Service. For more information call us at (877) 944-7844.